A security company is only as good as its representatives, so we work hard to make sure our officers represent ESI and our clients well. Because one of our specialties is in special event security, our training programs are specific to events such trade shows and conventions. Our seasoned and experienced training staff works with our security staff to meet and exceed the training guidelines for protective security in Nevada. 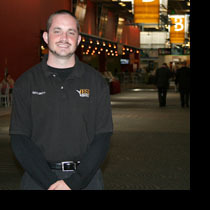 Our scheduling staff analyzes and researches each event to place each security officer and ensure they are a good fit. ESI provides a dedicated Client Care Specialist, or CCS, that will be available from the start of your show until the last door is closed at the end of the event. Your CCS will oversee all security officers at the event and ensure that everything runs smoothly. All ESI Client Care Specialists are knowledgeable and experienced in special event security and work hard to meet our client’s needs. Many of our CCS’s are asked for by name and develop great working relationships with our clients.